This is a notebook that I made as a christmas present for my mum. 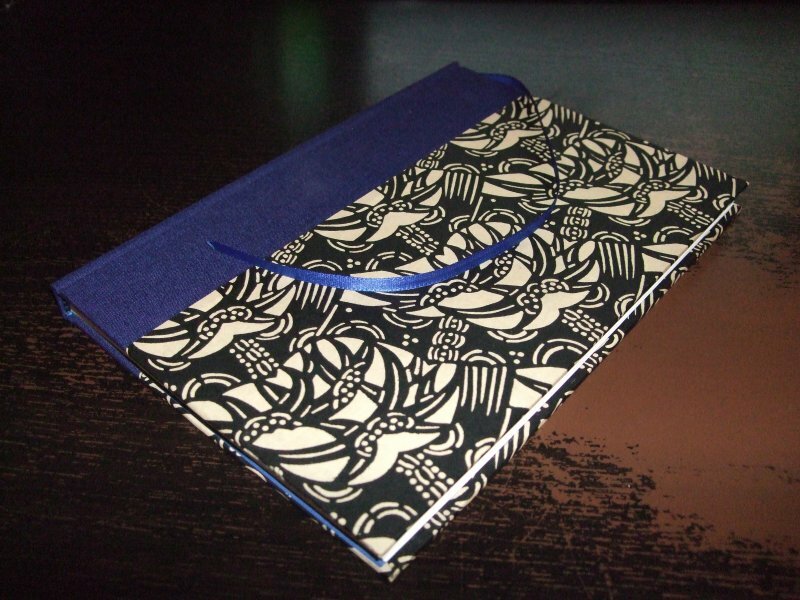 I built it as part of a workshop that teaches how to make such books, and as such it is the first book I have ever made, but it came out rather well. The notebook started as a pile of paper, card and thread and glue, and finished complete with kettle stitching, endpapers, headband, tailband and ribbon. The whole process took 6 hours, including breaks, and waiting for various stages to dry. The workshop I attended was organised by a lovely man called Ken Futers, who you can occasionally meet in the Cambridge arts and crafts market. He also maintains a website where you can see his work and see his workshop dates. In our case, we organised a group workshop at a location of our choosing, which you can do if you have 4-6 interested people.